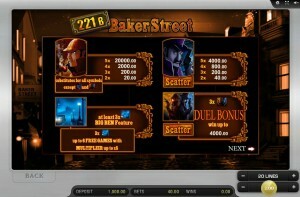 221B Baker Street is a Sherlock Holmes-themed slot machine that’s available at SlotsClub.com and elsewhere online. For gamers seeking free online slots, this is an excellent option, but you can also choose to play it for real money and even win 20,000 on a single bet line. 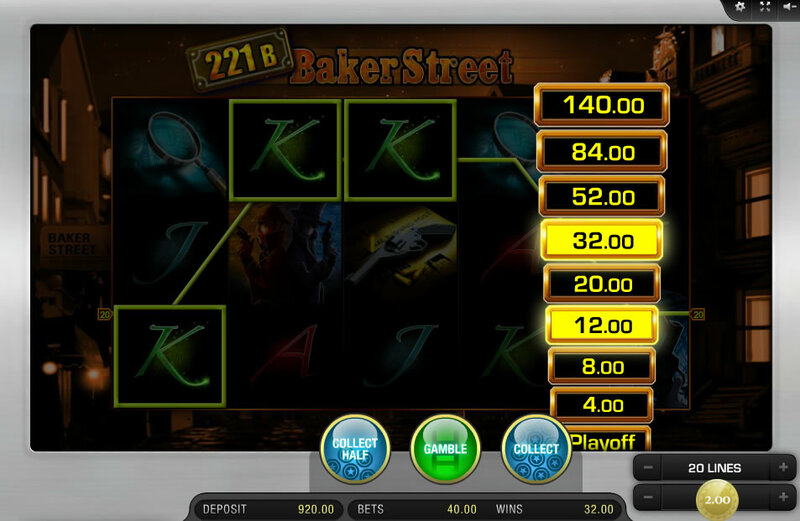 This game is developed in the Vegas slots style of video slot machines and boasts rich artwork, animation on the reels and an original soundtrack that help set the stage for mystery and intrigue. The game has five reels and 20 bet lines. You can play just one bet line or increase that amount in increments of five. The small coin size is $0.01 and the large coin size is $2. Therefore, you could play for as little as a penny with just one line active or spend as much as $40 per spin. Set your coin size and the number of active lines and then click Spin to begin. Sherlock Holmes is the fictional detective created by Sir Arthur Conan Doyle, and 221B Baker Street was the London address where Holmes lived as did his assistant Dr. John H. Watson at times. It’s worth mentioning that the game never actually references Holmes or Watson in name. Therefore, this is likely an issue of licensing with the developer taking advantage of what’s in the public domain and avoiding that which is not. 221B Baker Street falls short of telling a story, but it does set one up. Music sets the mood. Holmes is in his thinking mode with his cap on and pipe lit. Watson has his gun at the ready. It’s clearly night time and foggy. The scene of Holmes and Watson back to back is probably their attempt to work out the specifics of the crime scene. 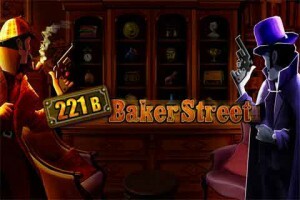 The Sherlock Holmes symbol serves as both the jackpot symbol, which can award up to 20,000 coins with five across, and the wild symbol, which can stand in for any non-special symbol. Dr. Watson is one of the special symbols, a scatter that pays out without the need for the symbols to be adjacent. The symbol depicting a foggy London evening is a bonus symbol. 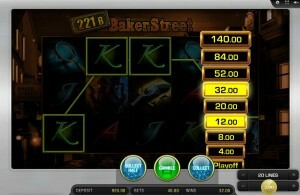 With three or more bonus symbols, the Big Ben feature awards you up to 20 free games with a multiplier as high as x5. The symbol with Holmes and Watson back to back is another scatter that can award up to 4,000 coins. Filling out the symbol set are a pistol, vial of blood, magnifying glass and the classic A, K, Q and J. 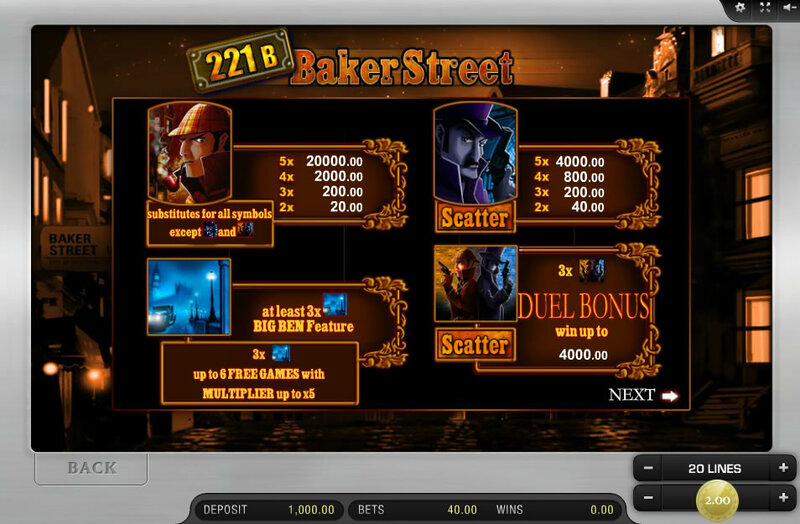 Any Casino slot game with a Sherlock Holmes theme has an intriguing element to it. This is definitely an underused license of online casinos. Imagine the possibilities for clues and detective work to be integrated. Even without those advanced elements, this is a fun game. The original music really stands out and sells the atmosphere, and an option to let it play between spins would be nice. Something else that stands out about this game is the manner in which the pay table updates based on your settings. There’s never any doubt about how much the jackpot or any other feature will pay. 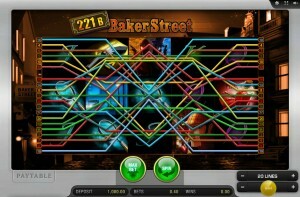 The game also plays very fast, and when you win, including on multiple lines, it shows you exactly why and how much. 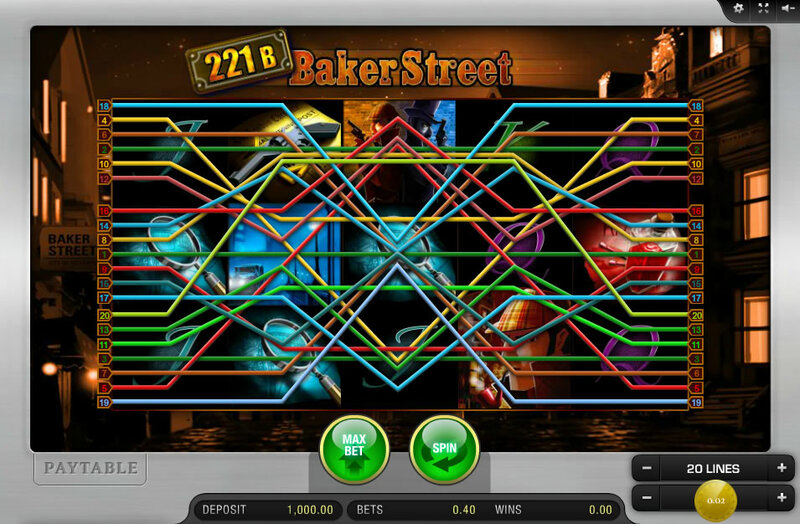 221B Baker Street also has an Auto Start mode that lets you automate up to 100 spins, and it automatically pauses the action whenever you achieve a win of any amount.